Loren Mulraine received his B.A. from the University of Maryland, College Park and his J.D. from Howard University School of Law. While at Howard, Professor Mulraine was a merit scholar, earned the Dean’s Excellence Award in Government Contracts and served as lead articles editor of the Howard Law Journal. 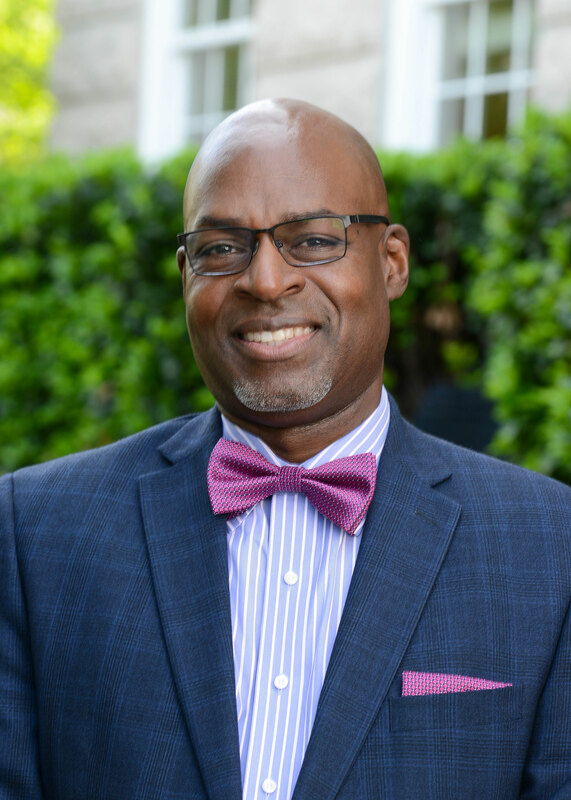 He began his legal career as a government contracts attorney with the Federal Aviation Administration in Washington, D.C. before relocating to Nashville to practice entertainment law. His legal clients have included Grammy, Dove and Stellar award winners, gold, platinum and multi-platinum selling artists, producers and songwriters, as well as filmmakers, independent labels and management companies. Before joining the law faculty at Belmont, Professor Mulraine taught for 14 years at Middle Tennessee State University, most recently serving as the Chair of the Department of Recording Industry. He served two non-consecutive terms as interim Associate Dean of the College of Mass Communication at MTSU and has also taught at Oakwood University in Huntsville, Alabama. Professor Mulraine has significant experience as a songwriter and independent gospel artist with four solo recordings, several group projects, and session work which includes the Grammy award-winning Andrae’ Crouch project, Tribute: The Songs of Andrae’ Crouch. Professor Mulraine is a member of The Recording Academy, Gospel Music Association, American Bar Association, National Bar Association, MEIEA, Leadership Music, Leadership Middle Tennessee, and the Black Entertainment and Sports Lawyers Association. At Belmont, Professor Mulraine teaches Entertainment Law, Copyright Law, Intellectual Property, Media Law, Sports Law, and related courses in the Entertainment and Music Business curriculum. A Global Perspective on Digital Sampling Akron Law Review, (forthcoming, Spring 2019). Religious Freedom: The Original Civil Liberty Howard Law Journal, Vol. 61, No. 1. (2017). Collision Course: State Community Property Laws And Termination Rights Under The Federal Copyright Act – Who Should Have The Right of Way? Marquette Law Review, Vol. 100. (2017). Fair Play Fair Pay: The Need For A Terrestrial Performance Right Belmont Law Review, Vol. 3:1 (2016). Loren Mulraine et al., Intellectual Property, Entrepreneurship and Social Justice (ed. Lateef Mtima, Elgar Publishing) (2015). Loren Mulraine, Doin’ the Math: Record Deals, Royalties & Production Deals, Gospel Industry Today (2004). Loren Mulraine, This Year‘s Goal: Excellence, Gospel Industry Today (2004). Loren Mulraine, Birthing A Record Company - Pt. 2., Gospel Industry Today (2003). Loren Mulraine, Birthing A Record Company - Pt. 1., Gospel Industry Today (2003). Loren Mulraine, Business Is Business!, Gospel Industry Today (2002). Loren Mulraine, The Business of Ministry - Pt. 3, Gospel Industry Today (2002). Loren Mulraine, The Business of Ministry - Pt. 2, Gospel Industry Today (2002). Loren Mulraine, The Business of Ministry - Pt. 1, Gospel Industry Today (2002). Loren Mulraine, The Law As A Career, Gospel Industry Today (2002). Loren Mulraine, The State of the Industry, Gospel Industry Today (2002). Loren Mulraine, The Business of Gospel Music, 11 Tennessee’s Business (2002). Loren Mulraine, The Value of Negotiation, Gospel Industry Today (2002). Loren Mulraine, Understanding Royalties, Gospel Industry Today (2002). Loren Mulraine & Hallerin Hilton Hill, The Course: Mastering the Music Business, Vol. 1: Copyright Law (Wisdom House 2002). Loren Mulraine, Seven Rules for Negotiation, Gospel Industry Today (2001). Loren Mulraine, Transfer of Copyright & Termination of Transfer, Gospel Industry Today (2001). Loren Mulraine, The Foundation of A Copyright Infringement Case - Pt 1, Gospel Industry Today (2001). Loren Mulraine, Wake Up Call for Napster, Gospel Industry Today (2001). Loren Mulraine, Contracts…What‘s the Big Deal Anyway?, Gospel Industry Today (2001). Loren Mulraine, Major, Indie, Artist-Owned Label?, Gospel Industry Today (2001). Loren Mulraine, Protecting Your Trademark Or Service mark, Gospel Industry Today (2001). Loren Mulraine, The Jury‘s Still Out On Napster, Gospel Industry Today (2000). Loren Mulraine, Don‘t Sleep On Napster, Gospel Industry Today (2000). Loren Mulraine, Tips for Artists - Selecting An Attorney & Getting the Deal, Gospel Industry Today (2000). Loren Mulraine, From the Mailbag…Work for Hire, Gospel Industry Today (2000). Loren Mulraine, Digital Transmission…Can It Be Controlled?, Gospel Industry Today (2000). Loren Mulraine, Collaboration…Here We Go Again!, Gospel Industry Today (2000). Loren Mulraine, Licensing Music For Church Services, Gospel Industry Today (2000). Loren Mulraine, New Millennium Issues, Gospel Industry Today (2000). Loren Mulraine, Doin’ The Deal: Soundtracks and Compilations, Gospel Industry Today (2000). Loren Mulraine, Entrepreneurship Comes of Age, Gospel Industry Today (1999). Loren Mulraine, Another Look At the Mailbag, Gospel Industry Today (1999). Loren Mulraine, HEY! That‘s My Song!, Gospel Industry Today (1999). Loren Mulraine, Joint Authorship: Just What Is It?, Gospel Industry Today (1999). Loren Mulraine, Q&A Re: Independent Record Labels, Gospel Industry Today (1999). Loren Mulraine, Publishing Income From A Production Deal, Gospel Industry Today (1999). Loren Mulraine, Songs and Publishing Deals: Term Agreements - Pt 2, Gospel Industry Today (1999). Loren Mulraine, Songs and Publishing Deals: Term Agreements - Pt 1, Gospel Industry Today (1999). Loren Mulraine, Distribution - What Is It…How Do You Get It?, Gospel Industry Today (1999). Loren Mulraine, Producers/Producers‘ Royalties/ Production Deals, Gospel Industry Today (1999). Loren Mulraine, Royalty Statement - Part 2…Understanding Record Company Royalty Statements, Gospel Industry Today (1998). Loren Mulraine, Royalty Statements - Part 1, Gospel Industry Today (1998). Loren Mulraine, Some O‘ Dis & Dat…The Issue of Sampling, Gospel Industry Today (1997). Loren Mulraine, The Mail Bag…Songwriting - How to Handle Collaborations, Gospel Industry Today (1997). Loren Mulraine, The Mail Bag…., Gospel Industry Today (1997). Loren Mulraine, The Independent Revolution, Gospel Industry Today (1997). Loren Mulraine, Taking Care of Business, Gospel Industry Today (1996). Loren Mulraine, Know the Score with Music Attorneys, Gospel Industry Today (1996). Loren Mulraine, Choice of Corporate Form - Part 1, 3 Gospel Industry Today (1996). Loren Mulraine, To Sign Or Not To Sign…That Is The Question, 3 Gospel Industry Today (1996). Loren Mulraine, Mechanical Licenses/Statutory Royalties - Pt 2, 3 Gospel Industry Today (1995). Loren Mulraine, Mechanical Licenses/Statutory Royalties - Pt 1, 3 Gospel Industry Today (1995). Loren Mulraine, How Does This Thing Work?, 3 Gospel Industry Today (1995). Loren E. Mulraine, Professional Responsibility: The Imminent Peril of Neglecting a Legal Matter, 33 How. L.J. 411 (1991). I Am My Brother’s Keeper: How the Crossroads of Entrepreneurship, Media, Intellectual Property and Entertainment can be used to Affect Social JusticeFrom the book INTELLECTUAL PROPERTY, ENTREPRENEURSHIP AND SOCIAL JUSTICE – From Swords to Ploughshares, Edited by Professor Lateef Mtima; Elgar Publishing. (2015).